After washing dishes by hand and folding laundry, mopping is my next despised chore. First you have to get everything off the floor. Then you need to sweep. After you pick that up, you have to fill a bucket with warm water and cleaning solution. The worst part is constantly dipping the mop in and trying to squeeze out most of the liquid. I’m especially bad at this because the mop is always too wet and it takes forever to dry. If you live in a ‘cozy’ place like mine, you have to wait for one section to dry before you move everything over to start on the next. Plus, it never fails that someone will come in with shoes, drop food, or just walk in when it’s still wet. Mopping takes so long and it’s such a pain. The Spin & Go Touchless Mop & Wringer Cleaning System actually makes mopping kind of fun. After you dip the (washable) mop in, you drop it in the wringer. Then you step on the pedal and the wringer spins to take out the cleaning solution, similar to a salad spinner. The mop comes out the perfect dampness and the microfiber head covers the area just right. It only took about 10-15 minutes to dry – I was so happy! What would normally take several hours of sweating and sore arms, only took about 1-1/2 hours for the living/dining room, kitchen, AND bathroom. The best part is that it even made my family want to clean! My husband and daughter took turns stepping on the pedal. My daughter even begged to let her mop and said, “Thank you, Mama, for letting me mop.” Aah, music to my ears. When I was gone for a couple days, I came home to find that my husband had even mopped the house while I was away. So now a dreaded chore has become a family pastime. While I do not plan on mopping in fancy evening wear as portrayed in the ‘As Seen On TV’ infomercial, I am definitely loving my new Spin & Go. Get your own Spin & Go Touchless Mop & Wringer Cleaning System. Visit Spin & Go and tell me which feature (aside from the ones I mentioned) that you like best. Disclosure: I was provided with a Spin & Go Touchless Mop & Wringer Cleaning System to facilitate this review. The opinions expressed here are 100% my honest opinion. I like the ease of changing mop heads. A feature that I like best is that it spins at 2600 RPM, a speed guaranteed to clean my floors well! I really could use a good mop and I like how you can change the mop head so easily. 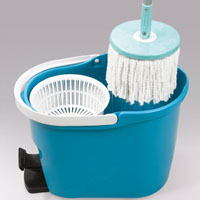 My favorite, or one of my favorite, features is the ease of changing mop heads to tackle a variety of surfaces. 🙂 Thank you. I LOVE THE FACT THAT MY ACHING BACK DOESN’T HAVE TO BEND OVER! Don’t push down the handle while wringing is what I learned. I like that you can easily take off the mop pads, wash them and use them again. I “Like” Spin & Go on Facebook. I’m following Cookies & Clogs on Twitter. I’m following via Google Friend Connect. I’m following via Networked Blogs. I voted for you at Picket Fence Blogs . You don’t get your hands wet and dirty while using it! I like that you can use different mop heads for different things. I love that it has an adjustable handle. i like that you don’t get your hands wet and dirty while using it! I love that I can use different mop heads. I like that you can change the mop head easily! I like how much it can absorb/clean at one time! I follw you on GFC! I like that you can change the mop head with your foot and that the handle is adjustable. I like that you can use it on a car. I like the foot pedal idea. It beats squeezing with the bottome with the hands. I like that I can change the head with my foot! A favorite feature is the easy way the mop heads can be interchanged. I like that the mop handle can adjust up to 90° in any direction to reach underneath hard to clean places. I like that I don’t have to touch the mop and wring it out by hand. That is so gross. I love that the mop handle can adjust up to 90 degrees in any direction. I like that you can change the mop heads easily! I learned that it can even be used on cars! i like that Spin & Go can clean everywhere! I like spin & go on FB!! I like Cookies & Clogs on FB!! I also like how easy and simple it is to change the mop heads. I am a fan of Spin and Go via Facebook as Jill Myrick. The feature I like is the easy to change mop heads. I like that it’s easy to switch the mop heads. Love that it can be adjusted to 90 degrees in any angle to clean. I like that the angle of the handle can be set to various settings. I am a friend of cookies and clogs on facebook. I follow cookies and clogs on twitter. I like the maximum water level indicator. “Like” Spin & Go on Facebook. “Like” Cookies & Clogs on Facebook. Following Cookies & Clogs on Twitter. i like that it spins 90 degrees in any direction. I love that it has 1,720,000 Micro fibers to pick the gunk up with. Spin & Go’s unique microfiber mop head gets rid of dirt and grime easily! I like that it spins in any direction. This mop would be GREAT for getting around behind the base of the commode! I follow C&C on Twitter (maill4rosey). “Powerful spinning cycle, up to 2600 rpms” wow! I like that there are no disposable pads to change or touch. I like the bright colors of the mop and bucket. This post I liked Cookies and Clogs on facebook. Voted at Top Mommy Blogs. I like that you don’t have to wring it out by hand. Looks like you can change heads easily and i love that it comes with its own bucket. But probably the best thing is not having to use your hands to wring it out. Pulls any spill off the floor into the mop head. Thanks for the giveaway…There are no disposable pads to change or touch. I visited Spin & Go and my fave feature is that it has a microfiber mop head which cleans much better and that also you can have different mop heads for different rooms/reasons! Hey, since this wrings out most of the water, you can use it upright to do your windows. Great feature! wow, how cool, i love the size too! I like that you can use this mop on glass and windows. I like Spin & Go on Facebook. I follow Cookies & Clogs on twitter as willitara. I like that the mop handle can adjust up to 90 degrees in any direction. This makes it easy to clean under surfaces. Rinse mop head to get rid of dirt & grime.